History and ivy league universities dominate Boston's scene. Bikabout's city guide has biking tips, routes curated by locals, and logistical resources you'll need to wander Boston by bike. Boston may not be the first American city you think of when someone mentions "cycling," but Boston has several key advantages going for its would-be cyclists. First, it's relatively small and flat, which makes everything a much easier bike destination. Second, it has a "We're Just As Good As NYC" complex, which means that when Mayor Bloomberg began to double down on NYC bike infrastructure in the early 2000's, Boston eventually refused to be embarrassed by comparison. In 2007, then-mayor Thomas Menino reacted to Boston being labeled one of the worst bike cities in the country by creating a new city bicycle division called Boston Bikes, and by appointing MIT and Stanford graduate / former Olympic cyclist / all-around bikey dreamboat Nicole Freedman to head it up. Since then, Freedman has overseen a radical remaking of Boston's bike infrastructure, with dramatic results. And while culture is more slow to change than infrastructure, as of 2014 Boston and Cambridge are positively teeming with regular people doing regular things on a bicycle. Common sense is making a steady comeback, and it is now entirely possible to spend your days biking to and from Boston's major (and minor) attractions in relative ease aboard a bicycle in a way that locals could only dream of ten years ago. Boston is very good now, and getting better all the time. Contrary to what Spinal Tap may have led you to believe, Boston remains solidly a "college town." That comes with advantages and disadvantages. On the plus side, there are often a lot of cyclists, which pays universal dividends with sheer numbers making the routes safer. On the not-so-plus side, some of those riders are inexperienced, and they do not always behave in the predictable manner that a Dutchman or Portlandian might expect. For the most part, a visitor biking through Boston / Cambridge in 2014 will find themselves surrounded by cyclists who are regular folks doing regular things predictably. The difficulty of owning and operating a car in Boston continues to recruit new cyclists, which has meant an increasing number of "normal" people in the bike lanes with each passing week. Gone are the days when only athletic, spandex-clad white men in their 40's and 50's would dare to brave the streets of Boston and Cambridge aboard a bicycle. These days, it's entirely possible to spot dutch cargo bikes parked outside sidewalk cafes, or to be passed by someone hauling a dog in a bike basket. The twisty one-way streets, limited parking, and flat terrain have finally teamed up with common sense to challenge the dominance of cars in Boston. Hand signals are present but not especially enforced by peer pressure. Lights are required by law, and a bell is a very good idea even if you don't get a ticket for not having one. When passing, it's common and appreciated to toss out a nice "On Your Left" as you're coming up around. When riding paths that are shared with pedestrians, like those along the Charles River, you are expected to pass those on foot with courtesy (which means slowing down slightly, and not passing too closely), even if they're walking 4-abreast and chatting about something inane. Stopping for pedestrians in marked crosswalks is state law. Helmets are required for riders 16 years of age and under. Pedestrians staring at smart phones while waiting to cross the street are to be treated like 150-pound squirrels. Cab drivers are to be treated as though they are radioactive. Boston doesn't have the avid Bike Theft scene that New York has, but it's still wise to lock your bike well if you're going to walk away from it. Your trusty author has even had a homeless gentleman in Kendall Square attempt to grab his bike while it was a mere 3 feet away. When challenged, said gentleman's reply was "I thought maybe it was abandoned." As always, a quality u-lock connecting your frame to an honest-to-god bike rack is your best bet. If you're forced to leave a bike on the street in Boston Proper overnight, you're wise to add a second lock securing your seat and/or front wheel. As everywhere, thieves in Boston are predominantly opportunists, and a well-locked bike represents a lot more work to steal than some student's newish single speed secured with a flimsy combo cable lock. 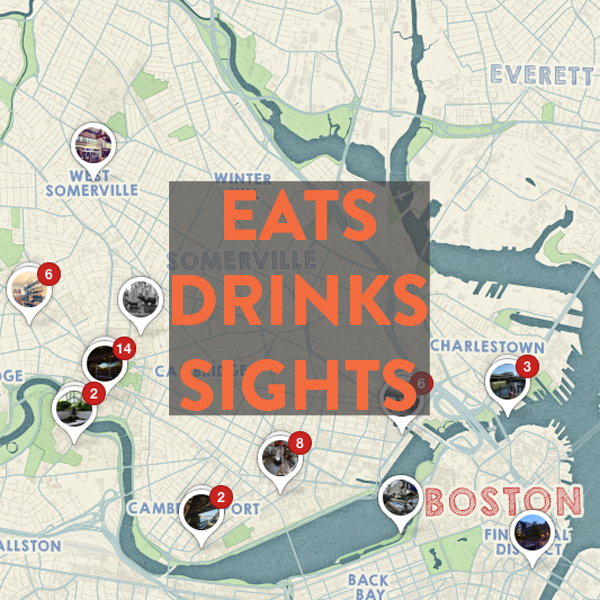 These routes were curated by local Bostonians who wanted to share their #BestBikeRide with you. Print off the map for free! We're constantly updating this list of our favorite bike shops, coffee shops, restaurants, museums, scenic vistas, playgrounds, ice cream, microbreweries and more in Boston! Boston is host to many hotels that either offer complimentary bikes to guests or are located on the best biking paths. Click here for the lodging directory. MBTA - "the T" operates the subway, buses and commuter rail. 95% of the buses have front bike racks and you are allowed to take your bike on the subway and commuter rail at all times except for rush hour. Bikabout donates 25% of annual revenue to local advocates. You, too, can power better biking in Boston and Massachusetts by becoming a member of any of the great non-profits below!